A wooden villa located about 10 minutes away from Panjim, it’s built from wooden logs and boasts of French windows and traditional awnings. With four bedrooms, a massive kitchen and a garden, the villa is in our top five stay options we’ll consider before going to Goa. At INR 12,650 per night for 12 people, it’s affordable and makes for a great reunion/bachelor party pad. Facilities include wifi, garden, parking, microwave and a driver who can be hired for local travel. There are two fully equipped kitchens with dishwasher, microwave ovens, baking oven, U.V. filter, hot and cold water fountain, clothes washing machine and dryer etc. Guests can procure groceries from the nearby supermarkets. The villa is situated in Panjim, one of the most popular parts of Goa and almost equidistant from both North and South Goa. Take a flight, hop on a train or do the good old road trip to Goa. 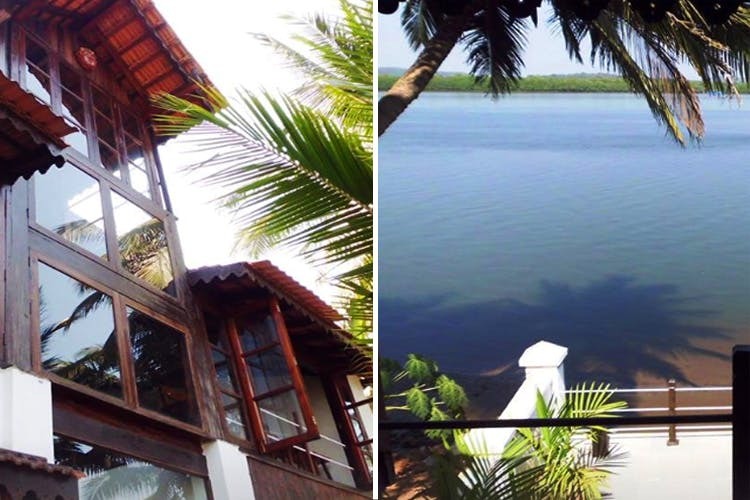 The villa is gorgeous and is literally on the shores of Mandovi river. It’s quiet, fully-equipped with facilities and affordable. We’ll just stop there. Swimwear, comfy clothes, sunscreen, beach essentials and snacks.